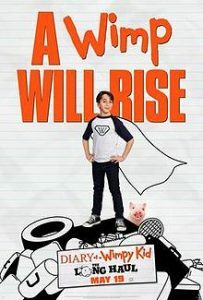 The latest in the Wimpy Kid series, based on the books by Jeff Kinney, Diary of a Wimpy Kid: The Long Haul sees director David Bowers (Flushed Away, Astro Boy) deliver yet another unmissable film. The Heffley family are back, having decided to go on a family road trip to attend Meemaw’s 90th birthday party. Things don’t go exactly to plan, however, thanks to Greg’s latest scheme to get to a video gaming convention, as he continues to find himself in unwanted circumstances. The film displays a mix of cartoon graphics (as illustrated from the Wimpy Kid novels) and includes the wimpy kid characters that children have grown up with. These include Greg Heffley (played by the young and talented Jason Drucker), and Greg’s older troublesome brother Rodrick (Charlie Wright). Audience members can relate to their own sibling rivalries when watching the exchange between the two brothers, as they try to ‘even the score’ between them. In other roles, Dylan & Wyatt Walters play younger brother, Manny, and Owen Astzalos plays Greg’s best friend, Rowley, with all cast members displaying their acting talents. Greg tells his audience during the film, “If there’s one thing i’ve learned as a kid, it’s that you have zero control of your life.” This is seen when Greg meets his favourite YouTube star, with both of them thinking of each other as celebrities. An inside joke regarding ‘Diaper hands’ leaves Greg with minimal control in how he will view his life and how others will view him from then onwards. Be prepared for dorky sing-a-longs conducted by parents, Susan (Alicia Silverstone) and Frank (Tom Everett Scott), as they attempt to make road trips fun and family-focused, while also proving to the kids that they don’t need to be consistently connected to technology in order to have a good time. Technology has rapidly risen over the years and this definitely shows in this film, from YouTube celebrities, to memes and game conventions. “The only connecting we will be doing is with each other”, Susan tells the kids during the road trip. Each child and their parent should be able to identify the misunderstandings between Susan and Greg, as sometimes life gets too busy for individuals to see things from the other person’s point of view. However the film maintains the importance of understanding and being there for family members, even in the most unlikely circumstances, such as attending the Player Expo. While Greg’s aim is to attend the expo, he convinces his older brother to come along on the way. Learning occurs in the most unexpected places sometimes. The persuasiveness of a child’s ideas is another theme which is explored, and family audience members will be able to relate to this as well. Even though this is a kids movie, it does have some themes which are current for individuals of all ages. These include jokes and sarcastic remarks which adult viewers will likely find enjoyable and funny. Diary of a Wimpy Kid: The Long Haul is in cinemas from 29th June through 20th Century Fox. Tags: film review, films, review, writing. Bookmark the permalink. Previous post ← What does a beauty writer’s evening beauty routine look like?